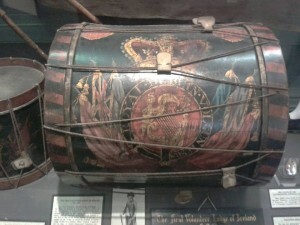 Royal Dublin Volunteers drum on display in the Masons Hall in Dublin. The Volunteers were originally set up to protect the island from imminent invasion, but in time due to the injustices in trade and social laws, the Volunteers saw many if not most take up arms with the United Irishmen in 1798. Modern bar room audiences clap their applause. The bravery for God and King, that cause theirs. Background – both sides, Unionists and Nationalists in Ireland have songs about the tragic battles of the Turn Oot of 1798, the idealism, the treachery, the butchery of the defeated. The songs often have the same airs, which can be confusing until you hear the words!! !